Four years ago the FBI made a public request for help to solve a mystery. + Ricky McCormick, who was dumped in a field in St. Louis, Missouri, had two encrypted notes stuffed in his pockets when police found the dead body. The FBI put out a fresh appeal in the hope that a new generation of amateur online sleuths and code-crackers can help solve the 1999 murder case that went cold. He could have signed one or two notes. "O-W-m-y H8L XORLX" or "O-W-m-4 H8L XORLX"
"OWN-Why I AM MCORM(i)K" or "OWN-for I AM MCORM(i)K"
Y= sound like "way" or "why"
So the hyphen is a punctuation mark used by Mccormick to join letters and to separate words of a single word. + Then "O-W-m-Y" must be one word, not two words, "OWNY" but i did not find this word in my book, a dictionary english-spanish until a few days ago on internet. SO "O-W-m-y H8L XORLX" means "On my ownsome i am Mcorm(i)Ck"
So I looked his signature. "O-W-m-Y H8L XORLX" = "Owny i am Mcorm(i)Ck"
+ And the hyphen joins letters creating a word. L = M + Cesar´s code again. + Remember the movie of Kubrick "2001 space odyssey". The joke about a computer called HAL because if we apply the Cesar´s code explained HAL is IBM, the famous company of personal computers. X = C, MC and CK. There is the part that is repeated, it is a typically shorthand solution. It reminded me that those who can not write signed with an X or something. L = M + again. (I) this vowel is added. The vowels are deleted except those necessary to understand the message (a shorthand solution).X = C, MC and CK. + Again. There is no code, is a personal and unique shorthand text. I guess the two notes are something like a will or last will. And, yes, I translated the 2 notes on my way in the chapter 4. + With these tools a perceptive person can to discover why Mccormick was to Marais Temps Clair Conservation Area on Monday, a near sighted will show that this action was not insignificant, so He buried a suitcase with 99,840 dollars and more below a hut to Birdwatching (And he also regrets the killing of someone) . INTERPRETING DREAMS for FREE TO A BETTER FUTURE for EVERYONE. 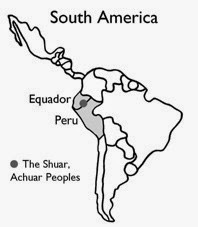 The legendary Achuar Indians of South America. ++ In the ancient times, dreams were used for healing purposes and for communication with the Gods. It was used as a rite of passage in certain tribes where they would carry out spiritual activities in order to receive a guiding dream and then share it with the rest of the tribe after it was received. The ancient Greeks constructed temples they called Asklepieions, where sick people were sent to be cured. It was believed that cures would be effected through divine grace by incubating dreams within the confines of the temple. Dreams were also considered prophetic or omens of particular significance by most cultures. __During the beginning of the 19th Century two influential psychiatrists Carl Jung and Sigmund Freud decided to take dreaming to the next level. Even though they had there own personal theories on what dreaming meant they both concluded that dreams where in fact an interaction between the unconscious and the conscious. __Artemidorus of Daldis, who lived in the 2nd century AD, wrote a comprehensive text Oneirocritica (The Interpretation of Dreams). Although Artemidorus believed that dreams can predict the future, he presaged many contemporary approaches to dreams. He thought that the meaning of a dream image could involve puns and could be understood by decoding the image into its component words. __For example, Alexander The Great , while waging war against the Tyrians, dreamt that a satyr was dancing on his shield. Artemidorus reports that this dream was interpreted as follows: satyr = sa tyros ("Tyre will be thine"), predicting that Alexander would be triumphant. Freud acknowledged this example of Artemidorus when he proposed that dreams be interpreted like a rebus. __Therefore although Sigmund Freud was the inventor of the analysis of dream symbols and the others neurologists who studied dreams all thought differently about what dreams meant, they all agreed that the meaning relied on the dreamer. ++ But even now, in the jungles of the Amazon live tribes to whom everyday reality is the dream. Hallucinations and dreams are the "real" reality, and the role of dreaming is thus very different from what it is in the West. There is a continuity between dreaming and waking. Dreaming is not just something that goes on during sleep. Marilyn Schlitz, PhD,worked with the Achuar Indians in the Ecuadorian Amazon. "They tell their dreams of what came up the night before........no one dreams for the individual. They dream for the collective. It's only in sharing the content that they get the full picture of what a dream means. And so their dreams are interpreted as a group." 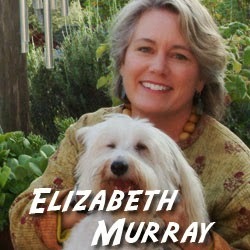 Marilyn Schlitz, Ph.D. is a social anthropologist, researcher, writer, and charismatic public speaker. "Among the Achuar," Schlitz said, "Usually, there's an elder person in the household who does the interpreting. Or if they do a community-based dream sharing, there is a set of elders who do the interpreting. It's a very cool thing, because it moves dreaming out of an individual's inner experience, the way we see it in the West." "Find access to forces that are not revealed in everyday 'illusory' awareness. They believe that something akin to a soul-body leaves their physical body to travel within a parallel world. The dream journey yields precognitive insights into the future — suggesting strategies for the day's activities." ++ Elizabeth Murray, who also has lived among the Achuar, points out that dreaming in that tribe is sometimes courted or sought. "Every person searches for his Arutum, or guiding vision, which comes from the forest. If a big decision must be made, a person might take one of the visionary plants and go to sleep next to a big tree for three to five days to find an answer." And in contrast to Western dream interpretation, where drug-induced visions have a category all their own, the source of a dream is of no significance to the Achuar. Whether a vision is drug-induced or occurs during normal sleep, the interpretation is the same. "My stay with the indigenous people of the Ecuadorian Amazon Jungle had a big impact as well. It’s comforting to be in a place where there has been no violence to nature and where trees are deeply respected as ancestral beings." NOTE: A vision quest is a rite of passage in some Native American cultures. The ceremony of the vision quest is one of the most universal and ancient means to find spiritual guidance and purpose. In practicing cultures, a vision quest is said to provide deep understanding of one's life purpose. 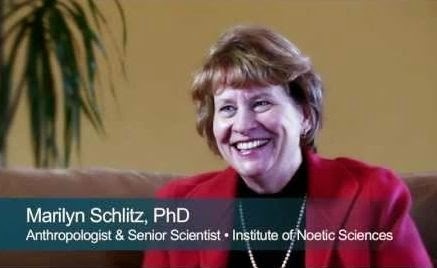 ++ Schlitz writes that she is "struck by the degree to which, back home in North America, far from the Amazon rainforest, dreaming is essentially personal. In one way this makes sense. Who among us would sacrifice our fundamental need for individuality?" "Yet, when taken as an end in itself, the only-personal lacks grounding in a larger whole. In our search for individuation, we have grown disconnected from our deeper selves, our community, our environment, and our sense of the sacred. We struggle to make sense of the subtleties of inner experience in a culture where reality is defined by that which can be physically measured. Could a fundamental source of our current cultural malaise be that we do not dream collectively?". ++ The Australian native people believed that each person had a part of their nature that was eternal. This eternal being pre-existed the life of the individual, and only became a living person through being born to a mother. The person then lived a life in time, and at death melted back into the eternal life: The "Dream time". __This is a term for the animist framework and symbol system of Australian Aboriginal mythology, introduced by A. P. Elkin in 1938 and popularized by William Edward Hanley Stanner and others from the 1970s for a concept of "time out of time", or "every when", inhabited by ancestral figures, often of heroic proportions or with supernatural abilities, but not considered "gods" as they do not control the material world and are not worshipped. __For the aboriginal tribes, there is no ending of life at ‘death’. Dead relatives are very much a part of continuing life. It is believed that in dreams dead relatives communicate their presence. At times they may bring healing if the dreamer is in pain. Death is seen as part of a cycle of life in which one emerges from Dreamtime through birth, and eventually returns to the timeless, only to emerge again. It is also a common belief that a person leaves their body during sleep, and temporarily enters the Dreamtime. __The landscape is almost an externalisation of the individual’s inner world. Each tribe had a traditional area of the land which was theirs alone, and it was believed that in the Dreamtime the ancestors shaped the flat landscape into its present features. So also used as a term for a system of totemistic symbols, so that an indigenous Australian may "own" a specific "Dreaming", such as Kangaroo Dreaming, or Shark Dreaming, or Honey Ant Dreaming, or any combination of Dreamings pertinent to their country. ‘Dreamtime’ is not what we think of as daydreaming, nor is it reserved for sleeping. 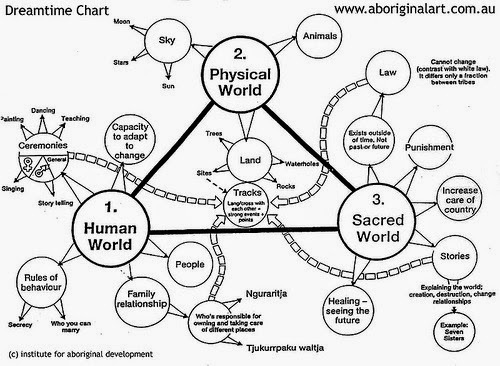 The Aboriginal Earthkeepers believe the world is real only because it has been dreamed into being.The myths apply three concepts. First, the human world of relationships, family, behavior, adaptation, and society. Then, the physical world of sky, land, sea, and animals. Last, is the sacred world of stories, healing, divination, law and justice, the keeping of the Earth, and the spirit/ethereal. NOTE: Australia, there are more than 500 Aboriginal tribes. Undoubtedly each tribe is unique and diverse, with its own distinct culture, just as is the case with American tribes. While many tribes may resemble one another, some will be quite different from others. __Now the Aboriginal people are depicted as mystical, gentle, wise souls. Native Americans have been systematically slandered, maligned and defamed for over a century by a whole genre of books, movies and television shows known as "The Western". Native Americans have been victims of a far worse distortion of their culture for a very long time.... But nobody is perfect. __Indeed, this reviewer believes we have much to learn from and benefit by the study of so called "primitive" cultures, such as Australian Aborigines, Native Americans, the peoples of Africa and many other peoples (both contemporary and historic). ++ The historical facts are that we're all connected, and we criss-cross inside of each other. The data suggests that we are not isolated beings, but in fact are in relationship at some core level. We all dream parts of something and this implies that if people took more time to share their dreams, we could begin to understand the future and the nature of our current relationships. __The idea behind group dream interpretation is that only through looking at all of the dreams can we arrive at a view of the whole. __Opinions about the meaning of dreams have varied and shifted through time and culture. The earliest recorded dreams were acquired from materials dating back approximately 5000 years, in Mesopotamia, where they were documented on clay tablets. In the Greek and Roman periods, the people believed that dreams were direct messages from one and/or multiple deities, from deceased persons, and that they predicted the future. 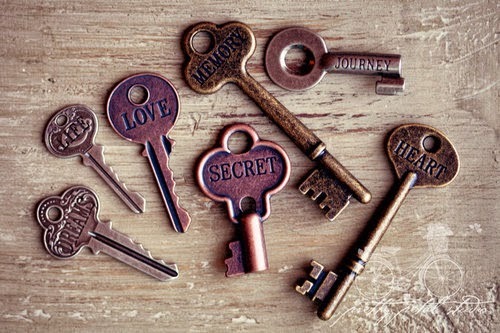 Some cultures practiced dream incubation with the intention of cultivating dreams that are of prophecy. __So, everyone has the right to speak his mind looking for an exchange of experiences awaiting a response. BOOK Descola, Phillipe,Spears of Twilight (The New Press, 1996). One pope will suffer bodily harm (JP II). "During this century one pope will suffer bodily harm. Another will be assassinated. The assassination will be the final blow to the office of the Holy See. This pope will be the same one who will be chosen in the not too distant future but whose election will not be approved by the Roman clergy. His influence, however, will be such that he will win out over the objections of his opponents. While this pope will be the last one ever to reign as singular head of the Church, the beginnings of this change will occur with one of his predecessors who will give far-reaching powers to his cardinals. These same cardinals will use their powers to replace him with one more to their liking." INFO ++ The events at FATIMA gained fame due to elements of secrets, prophecy and eschatology, particularly with regard to World War II and possibly more World Wars in the future. Chief among these is also the alleged urgent need for the Consecration of Russia to the Immaculate Heart of Mary. The reported apparitions at Fátima were officially declared worthy of belief by the Catholic Church. 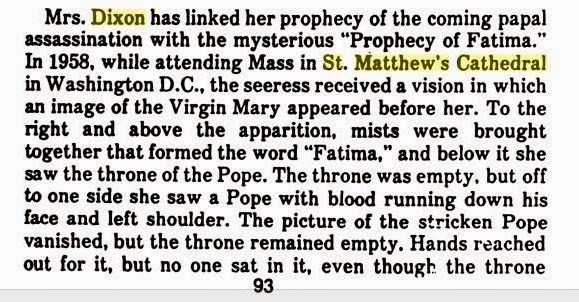 __As early as July 1917 it was claimed that the Virgin Mary had promised a miracle for the last of her apparitions on October 13, so that all would believe. What happened then became known as the "Miracle of the Sun". A huge crowd, variously estimated between 30,000 and 100,000, including newspaper reporters and photographers, gathered at the Cova da Iria. The incessant rain had ceased and there was a thin layer of cloud. Lúcia, seeing light rising from the lady's hands and the sun appearing as a silver disk, called out "look at the sun". __Jeane Dixon believes the Secret of Fatima was revealed to her, and it describes the violent death of his successor of Peter in the near future, and the decline of the Papal Authority as the center of the Church. NOTE: Jeane Dixon was a staunch Roman Catholic who attended morning mass all of her life at St. Matthew’s the apostle Cathedral downtown (1725 Rhode Island Ave NW, Washington, DC 20036)..... but she was married to James Dixon, a divorced man. 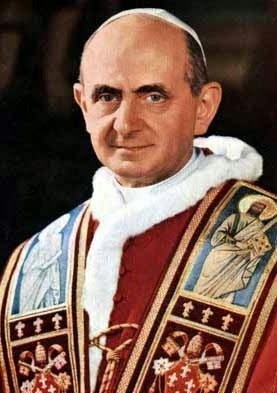 Pope + PAULUS Sextus (Paul VI). Last pope to be crowned in a coronation with the tiara. Pope + IOANNES PAULUS Primus (John Paul I). Abolished the coronation opting for the Papal Inauguration. Last pope to use the Gestatorial Chair (Sedia Gestatoria). 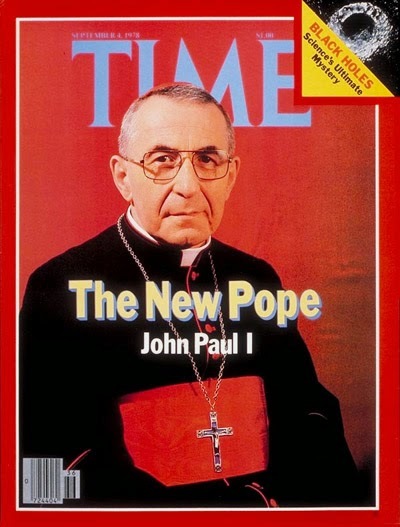 __Although there is a slight possibility her prediction of a papal assassination is a reference to John Paul I. John Paul I's death after only 33 days in office was said to probably have been a heart attack, but there was no autopsy done, so no one knows for sure. __There are conspiracy theories that claim he was actually assassinated (poisoned, that is NO bloody crime). I thought I would at least point that out. 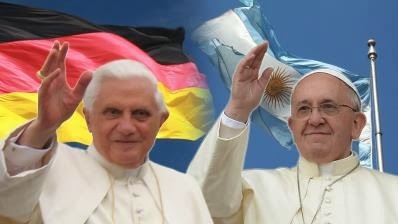 Pope + IOANNES PAULUS Secundus (John Paul II). 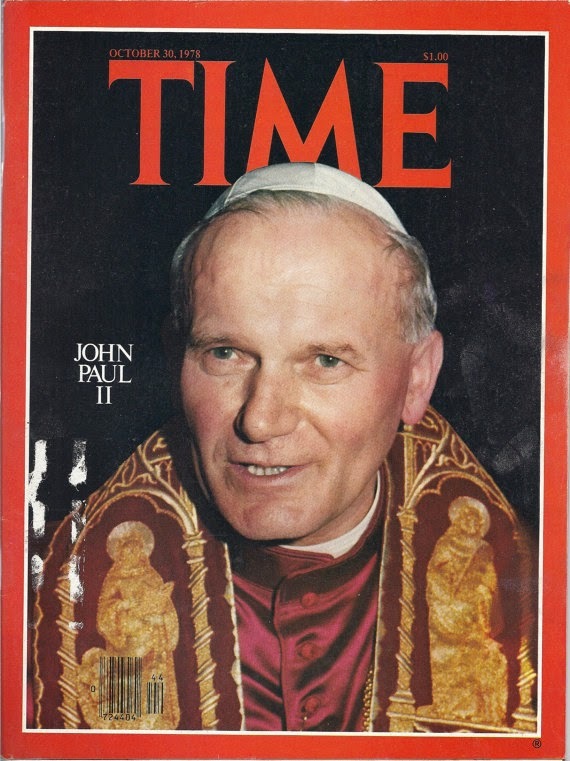 John Paul II is recognised as helping to end Communist rule in his native Poland and eventually all of Europe. A key goal of his papacy was to transform and reposition the Catholic Church. He was one of the most travelled world leaders in history, visiting 129 countries during his pontificate. As part of his special emphasis on the universal call to holiness, he beatified 1,340 people and canonised 483 saints, more than the combined tally of his predecessors during the preceding five centuries..
As he entered St. Peter's Square to address an audience on 13 May 1981,Pope John Paul II was shot and critically wounded by Mehmet Ali Ağca. The gunman shooting the pope in the abdomen and perforating his colon and small intestine multiple times. Even though the two bullets missed his mesenteric artery and abdominal aorta, he lost nearly three-quarters of his blood. "Could I forget that the event in St. Peter's Square took place on the day and at the hour when the first appearance of the Mother of Christ to the poor little peasants has been remembered for over sixty years at Fátima, Portugal? For in everything that happened to me on that very day, I felt that extraordinary motherly protection and care, which turned out to be stronger than the deadly bullet"
First pope to renounce the papacy on his own initiative since Celestine V (1294), retaining regnal name with title of Pope Emeritus. Benedict XVI announced his resignation in a speech in Latin before the cardinals, citing a "lack of strength of mind and body" due to his advanced age. He is known for having a simpler and less formal approach to the papacy, most notably by choosing to reside in the Domus Sanctae Marthae guesthouse rather than the papal apartments of the Apostolic Palace used by his predecessors. In addition, due to both his Jesuit and Ignatian aesthetic, he is also known for favoring simpler vestments void of ornamentation, including refusing the traditional papal mozzetta cape upon his election, choosing silver instead of gold for his piscatory ring, and keeping the same pectoral cross he had when he was cardinal Soon after Francis became Pope, the Brazilian theologian Leonardo Boff, supporter of the Liberation Theology, was cited in an article praising Francis. This led to a rumor that Francis may support that theology as well, which was soon disproved. Francis believes clergy should be shepherds looking after the people, but knows that clerics can be tempted and corrupted by power. When the clergy take from the people instead of giving, simony and other corruption can follow. So love between the clergy and the people is destroyed. ++ The alleged prophecies were first published by Benedictine monk Arnold Wion in 1595. Wion attributes the prophecies to Saint Malachy, a 12th‑century Archbishop of Armagh, Ireland. In p[er]ſecutione. extrema S.R.E. ſedebit Petrus Romanus, qui paſcet oues in multis tribulationibus: quibus tranſactis ciuitas ſepticollis diruetur, & Iudex tremẽdus iudicabit populum ſuum. Finis. 2000 + Third Secret of Fatima released. "After the two parts which I have already explained, at the left of Our Lady and a little above, we saw an Angel with a flaming sword in his left hand; flashing, it gave out flames that looked as though they would set the world on fire; but they died out in contact with the splendour that Our Lady radiated towards him from her right hand: pointing to the earth with his right hand, the Angel cried out in a loud voice: ‘Penance, Penance, Penance!' And we saw in an immense light that is God: ‘something similar to how people appear in a mirror when they pass in front of it' a Bishop dressed in White ‘we had the impression that it was the Holy Father'. Other Bishops, Priests, Religious men and women going up a steep mountain, at the top of which there was a big Cross of rough-hewn trunks as of a cork-tree with the bark; before reaching there the Holy Father passed through a big city half in ruins and half trembling with halting step, afflicted with pain and sorrow, he prayed for the souls of the corpses he met on his way; having reached the top of the mountain, on his knees at the foot of the big Cross he was killed by a group of soldiers who fired bullets and arrows at him, and in the same way there died one after another the other Bishops, Priests, Religious men and women, and various lay people of different ranks and positions. Beneath the two arms of the Cross there were two Angels each with a crystal aspersorium in his hand, in which they gathered up the blood of the Martyrs and with it sprinkled the souls that were making their way to God." __Lúcia declared that the Third Secret could be released to the public after 1960 but The Vatican withheld the Third Secret until 26 June 2000. This announcement triggered widespread speculation. According to the New York Times, speculation over the content of the secret ranged from "worldwide nuclear annihilation to deep rifts in the Roman Catholic Church that lead to rival papacies." ++ Jeane Dixon owes much of her fame to the profuseness of her prognostications, and the very few highly publicised predictions which were alleged to have been made before the event, and which came to pass. __Like many psychics, Mrs. Dixon was wrong about most of her predictions, and many of these also were documented in news reports. She even admitted in her books that some of her predictions had indeed failed. But she claimed that the revelations that came to her, usually in the forms of visions and dreams, were not wrong, explaining that she merely misinterpreted them. __The 1971 book, The Call to Glory, calls her one who “speaks as a prophet of God, fulfilling the mission He granted her.” The book’s acknowledgements recognize Rev. Stephen Hartdegen, a Roman Catholic priest, as Dixon’s “personal religious consultant” for the book. According to a Catholic newspaper, Dixon faithfully attended Mass each morning. __An examination of the prediction’s wording reveals the low probability of such an event occurring (The last Pope killed was Celestine V -1294, died 1296- : Held captive and allegedly murdered after his abdication, by order of his successor, Pope Boniface VII .... notwithstanding rumors of poisoned Popes). __The probability of kill or injure a Pope is very low because for many centuries have just left Italy and the Vatican buildings (John Paul II was the first non-Italian pope since the Dutch Pope Adrian VI, who served from 1522 to 1523). The third secret of Fatima was truly secret. __The last 2 Popes still alive so we can not confirm the accuracy of the two prophecies of Jeane Dixon, but at the present time the history shows that she knew the meaning of the third secret of Fatima and the bloody attack on Pope John Paul II. So, what Pope will be killed, when and where? Francis or Benedict ?.I bet by Benedict, just three miles of Lyon (France), when the comet to shine in the sky because according to Nostradamus a pope must die there.